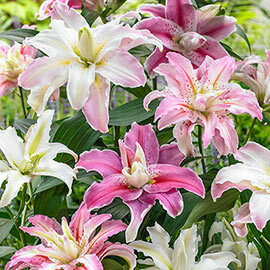 Double Oriental Lily Mix | Henry Field's Seed & Nursery Co.
Plant our Double Oriental Lily Mix and you'll be blessed with a collection of rare, double lilies in an array of colors that delivers a high-impact display to the garden. You'll love their long-lasting habit—both in the garden and the vase. Blooming during the summer season, these fragrant lilies are good naturalizers and make wonderful additions to seasonal borders, mixed beds and perennial plantings. Bring the blooms indoors to decorate your home with their showstopping colors and elegant form. Though they are fragrant, these lilies are pollen free, making them a favorite of allergy sufferers. 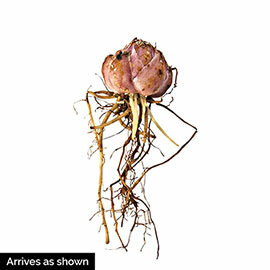 16-18 cm bulbs. For each offer ordered, get 4 bulbs. Foliage: Linear, green leaves arranged in whorls or spirals up the stems. Pruning: remove spent flowers. Do not cut down the stalk with leaves until it dies back, it is feeding the bulb for the next year's growth.